The band's name was coined by drummer Paul Hawley. Their first full-length CD was Scenes One Through Thirteen (2001) which comprised all of the three prior EPs released to that point. 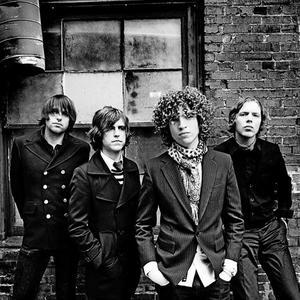 In Spring of 2002, the band released another EP entitled Knock Knock Knock, with Steve Bays taking over vocals, and Dante DeCaro adding guitars to the previously synth-heavy sound. That same year, the band entered the studio to record their second full length album, Make Up The Breakdown, for Sub-Pop Records which propelled Hot Hot Heat into greater popularity and provided the band with a strong fan-base. The video for their song "Bandages" off of Make Up the Breakdown even received rotations on channels such as MTV. In 2005 the band released their second album, Elevator, this time with Sire Records. This was a critical time for the band, because Dante DeCaro (guitar) decided to leave Hot Hot Heat. As one of the innovators of Hot Hot Heat's sound, the band considered breaking up. Wanting to continue the band, Luke Paquin was added as DeCaro's replacement. And although Elevator was recorded with DeCaro, Paquin is featured on the album art. In 2007, Hot Hot Heat released their third studio album, Happiness Ltd. to eagerly awaiting fans. The band decided to add new elements to their music, including an orchestra. "Vibe" is constantly used by the band to describe everything about the album. Hot Hot Heat is currently signed with Los Angeles indie label Dangerbird Records, and released their latest album, Future Breeds, in the summer of 2010. They are currently working on new music to be released in the near future.